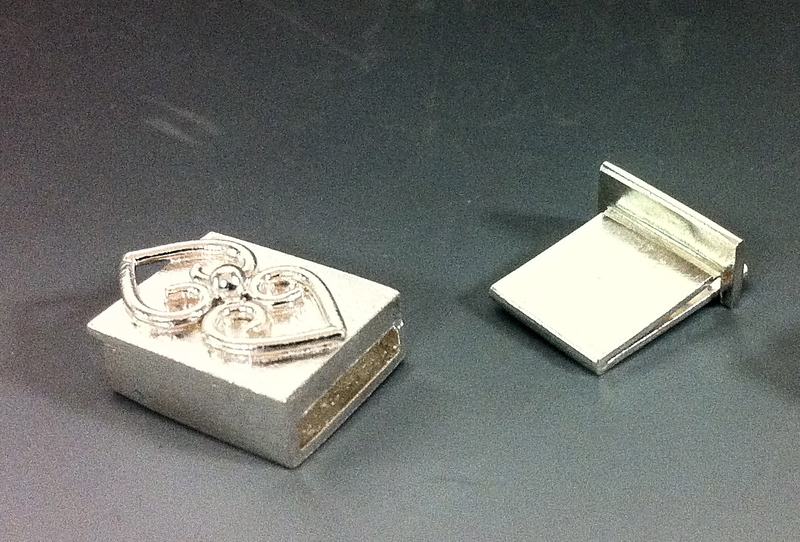 Jewelry Studies Intl was asked by Stuller to test the silver alloy called Continuum. It is a sterling alloy that is over 95% fine silver containing no nickle. I found this metal to be quite hard as compared to some of the other silver alloys I have tested. At JSI, I tested the malleability when I was teaching the metalsmithing class two weeks ago. It was much harder to manipulate with anticlastic metalsmithing and forging it took a bit more work as compared to tho other silver alloys I have tried. I can understand whey they say it would be good for die striking or milling products. The fact that it is harder than most of the silver alloy I have tested makes it the perfect alloy for fabricating clasps and mechanisms. It can be spot soldered like gold. It can be fused, granulated and enameled. It also did well with laser welding. Making the same clasp, Vasken soldered his while I fused mine. The box clasp on the right is soldered using hard and medium sterling solder, the decorative one on the left has been fused start to finish. 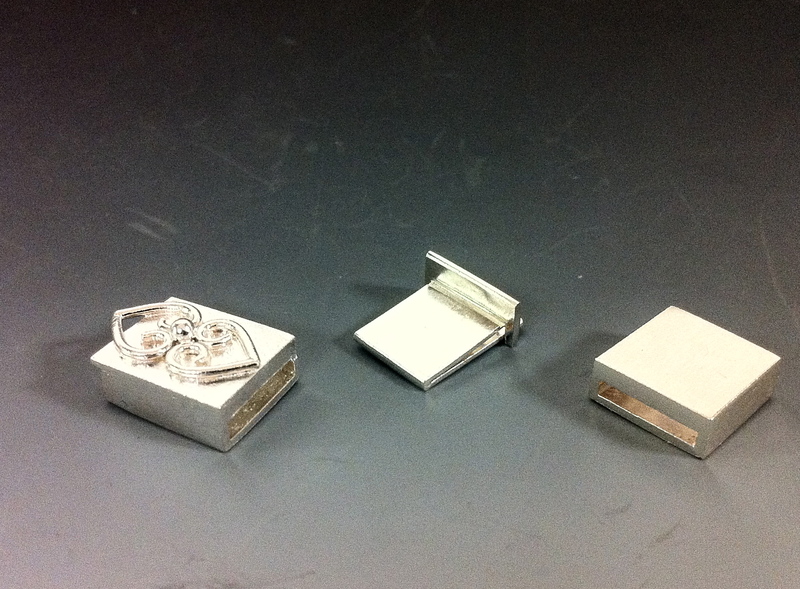 Vasken fabricated his clasp using hard and medium solder. 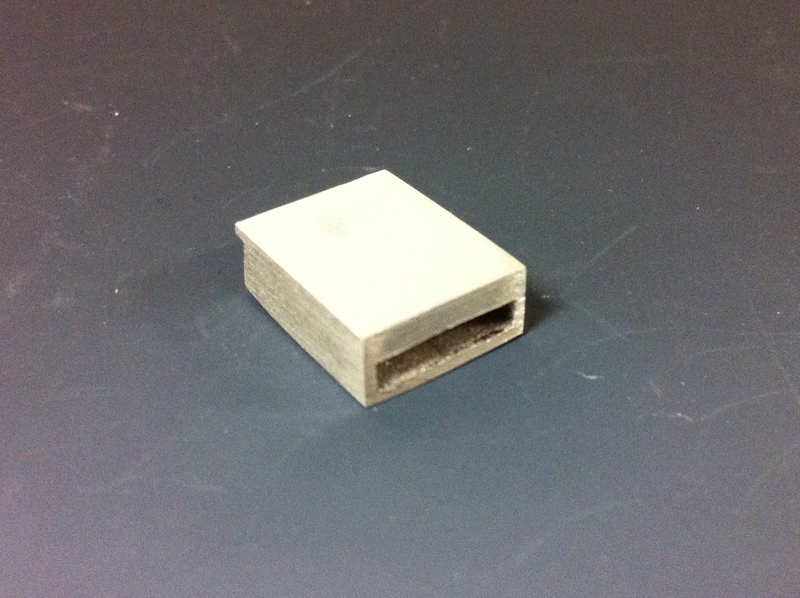 He did tests first on both an aluminum silicate block and a charcoal block. 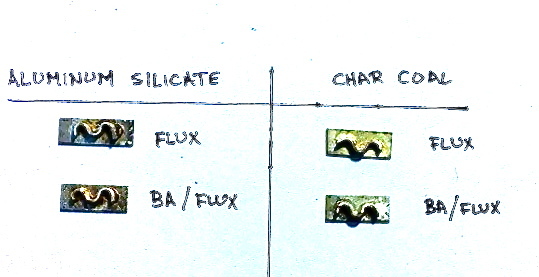 Vasken found that the best results were to coat with boric acid/alcohol mixture and use Batterns flux for seams and solder while working on the charcoal block rather than aluminum silicate block. He loved the way it reacted to sawing because it was like working with 14k gold, firm yet easy to cut and can be spot solder as you would with gold. 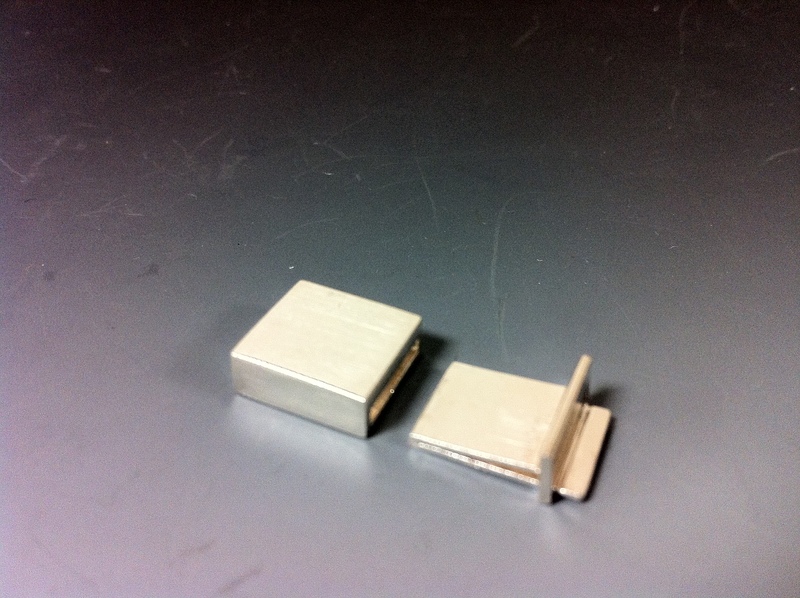 I fused a the same box clasp start to finish using no boric acid/alcohol except when annealing. I would coat everything in Batterns flux and fuse. The metal fused beautifully. There was no firescale. The fusability was quite good and the metal did not slump when heated to the extreme temperatures of fusing and had no firescale. 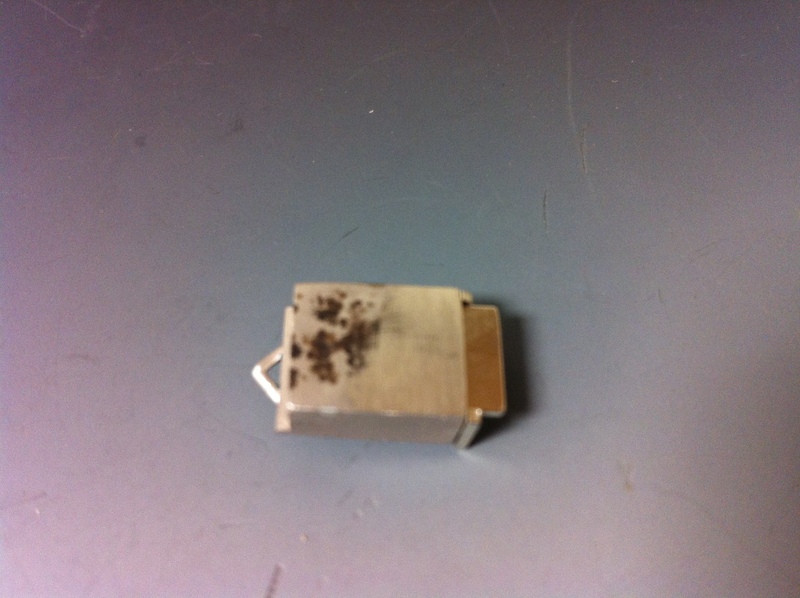 Vasken pointed out to me that I could now granulate on it since I had not used solder. Results were quite impressive. Teh wire I had extending past the clasp did not slump but was quite rigid. 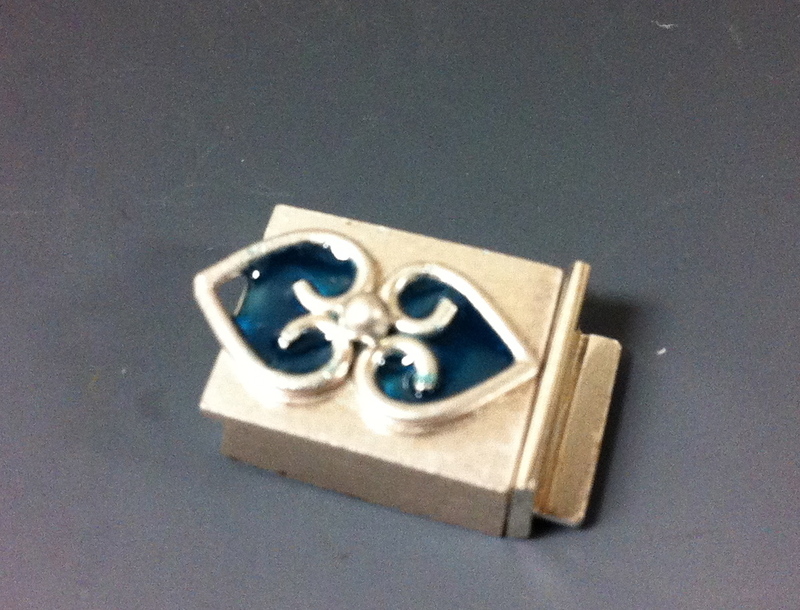 I went one step further and did a bit of torch fired enameling on the fused clasp with successful results. There was bit of black on the bottom that was exposed to the flame, as I had not coated the clasp in any boric acid/alcohol mixture. The black was not a penetrating firescale and was easily removed with fine sandpaper. I did not find the tarnish resistance of continuum to be quite as good as with Sterlium and the malleability was not as good as with the Sterlium. 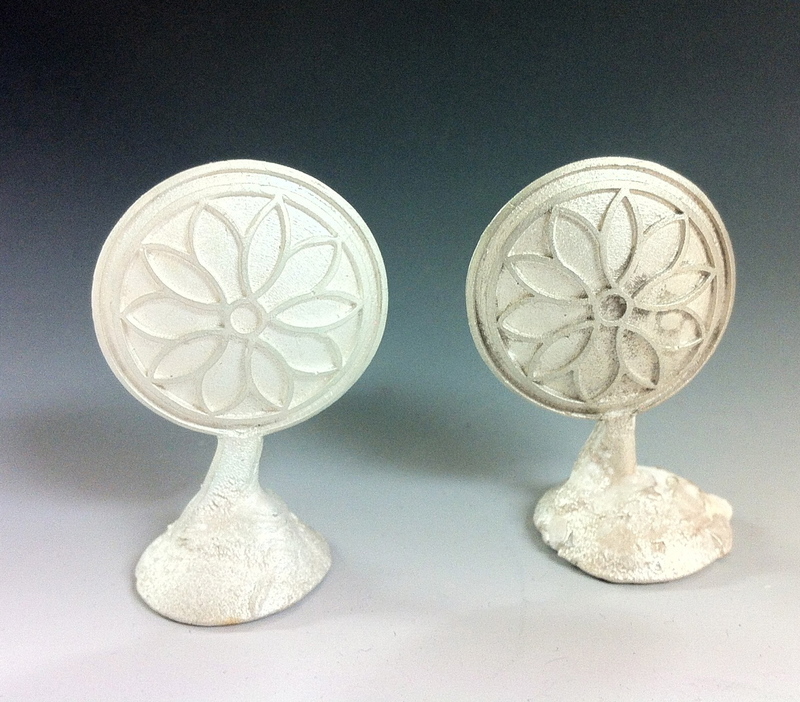 The castings are fresh from pickling. The second photo shows the pieces after 9 months of sitting on the shelf. Vasken and I find that both of these alloys are superior to traditional sterling. I am so excited about this! I have been wanting a fine silver alloy for earwires and other sturdier components for years! Very exciting! Can we order from Stuller yet? How’s the cost factor? I have been using Argentium wires and hardening them in the kiln and love the white color. I have found that people that can not wear sterling don’t seem to have a problem with Argentium! I will check about the cost factor and get back to you. I have a friend who is very sensitive to sterling… I am will whip out some Argentium earwires and have her test them! How long and at what temp do you fire them in the kiln? Thanks so much! This Sterling Silver can be orderd now. You can also get some findings and mountings in it also. I want to know about it’s use with enamel. Keep the info flowing. I teaching a casting class in a couple of weeks and will be doing some experiments with different alloys and torch fired enameling. I am not an enamelist, but am fascinated with it. 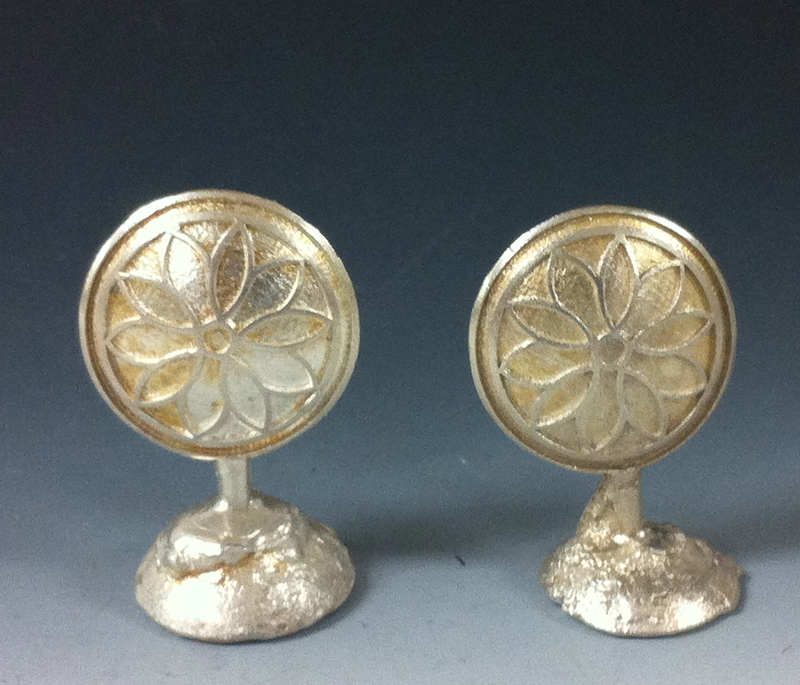 My first studio class in college was enameling… but that was decades ago.I will be posting my results. Continuum sterling can be enameled. Fish Industries from Thailand have been producing enameled Continuum pieces and they look fabulous! I have a photo of a marlin cast with Continuum glazed with high temperature glass enamel coating. Unfortunately, I was not able to paste that photo in this post. Because of its inherently superior cast strength, Fish Industries have been casting thinner and more delicate pieces (with enough strength) which could not be produced with other sterling silvers. So Rhonda, you also mention it responded well under the laser. What filler wire were you using? extra hard silver solder, AgPd , the continuum alloy itself or some other silver based alloy filler? I actually used Argentium laser wire.. a bit whiter than others. And it is what I have on hand. Can it be heat treated to make it springy? I’m making a cuff type bracelet, and I need a very springy silver alloy. Not much luck so far. Any help would be appreciated. Continuum is best suited for your type of applications. Contact either myself or John Butler at Stuller directly and we will guide you after learning how you make the bracelet. Visit http://www.stuller.com/continuum if you want to know more about Continuum sterling silver.